Home › Nick's Marathon › Stay Dry with Nick’s Marathon! Want to show the world you support a great cause and stay dry in the rain? 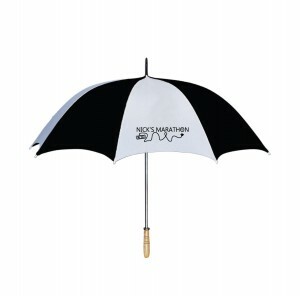 Then you need an official Nick’s Marathon umbrella! The ONLY way to get one is to make a donation to Nick’s Marathon of $100 or more, so click here and make your tax-deductible donation now! And for the first time ever, we are now accepting donations through Venmo as well as PayPal. We’re gearing up for this year’s Nick’s Marathon, and we’re aiming to make it the biggest and best event yet. Thanks for your support!